Do you know the total volume of used wash chemicals? What was the goal, and was the goal met or not? Do you know the actual chemical concentration levels used in the washes? How about when the chemicals run out; when did they run out and for how long was the washing machine without the chemical? Were any cars washed without the chemical at the station by mistake? One of the most challenging areas in car was businesses is to keep the chemical dispensing of a washing machine constantly adjusted correctly, thus ensuring the stability of the wash quality. Chemicals can often run out just before a weekend, causing a loss in wash sales. The chemicals may well run out without the station being aware of it, creating bad will due to the poor quality of washes. This results in the loss of wash customers. Station employees themselves often adjust the wash result by changing the nozzle of the hydrominder, and the dosing of the pumps. After this, the actual consumption of wash chemicals is no longer known, and neither is the optimal chemical dosing. The wash quality suffers, and there is a real danger of losing customers. A maintenance team must be summoned to adjust the washing machine. This, in turn, costs money and reduces the wash margin. Of all the wash chemicals, the pre-wash substances are the most expensive chemicals. 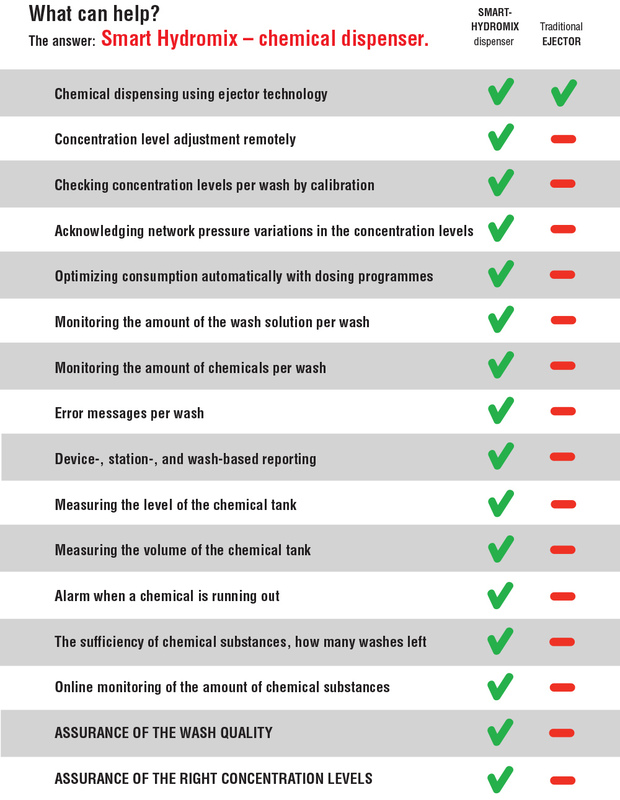 How can a merchant ensure effortlessly that the pre-wash substances are used in an optimal amount per wash, and the constant monitoring thereof? As the seasons change to summer and winter, the optimal consumption of chemicals should adhere to it. However, seasonal adjustments are typically made too late or too early. Thus, the optimal consumption of chemicals is not up to date considering the current season; in spring, winter wash substances are used too extensively; and correspondingly, in autumn, summer wash substances are in use for too long. In the southern parts of the country, the seasonal change happens at a different time compared to the northern parts of the country. It is very laborious to keep all the washing stations of a wash chain manually adjusted according to the current season, for example.